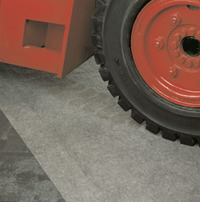 Needle-punched polypropylene stands up to rugged, heavy-traffic areas. PolyBacked Rug - A top layer of high-strength polypropylene fibers is backed with a chemical barrier to keep fluids from seeping through and to provide non-skid characteristics for safety. 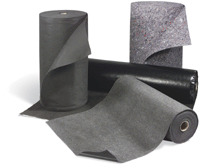 RagRug - Recycled polypropylene, acrylic and polyester fibers are bonded with polyvinyl acetate latex to form a strong, durable and economical solution to sorbing leaks and oversprays in traffic area. 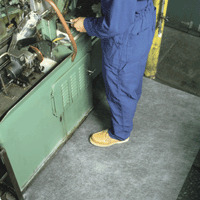 NeedlePunch Rug - A tough nonwoven fabric construction of 100% needle-punched polypropylene. Designed to sorb oils, coolants, solvents and water while standing up to rugged wear and tear. RailRoad Mat - Designed to provide sorbency and spill protection in rail-specific applications. A tier of sorbent MeltBlown material is top-layered with needle-punched felt for added strength and then poly-backed with a chemical-resistant material to keep unwanted fluids from getting into the ground.